A mixed taupe colour background with rich, light and creamy natural thick veins. It is non-porous, resistant to heat, scratches, stains and bacteria, and can be cleaned with regular detergents. 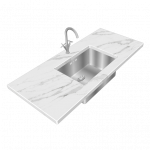 Suitable for any worktop project.